On November 5, 1996, the people of California and Arizona voted overwhelmingly to allow doctors to prescribe medical marijuana to their patients. This marks the return of a medicine that has been used by humankind for at least 5,000 years. Marijuana is far and away the most effective medicine in relieving the symptoms of those with AIDS, cancer, glaucoma, arthritis, epilepsy, MS, and many other illnesses. 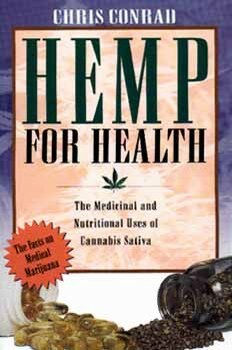 Hemp for Health is the first book to explain all the facts about this exciting medicinal herb. Chris Conrad explores every facet of Cannabis sativa's healing prperties, from its traditional uses in ancient China and India to the modern rediscovery of the nutritional benefits of nonpsychoactive hempseed. Hempseed is packed with protein, fiber, and essential fatty acids, which stimulate the immune system. Hemp for Health includes a section of recipes so that you can incorporate this ideal food into your diet immediately. In addition to examining the hundreds of scientific studies done on marijuana and explaining its therapeutic effects on each system of the body, Conrad includes practical information on how to get started with cannabis therapy, how to become part of the largest study of medical marijuana users ever undertaken, and what dangers -- legal and otherwise -- the prospective patient faces. One of marihuana's greatest advantages as a medicine is its remarkable safety. It has little effect on major physiological functions. There is no known case of a lethal overdose. . . . Marihuana is also far less addictive and far less subject to abuse than many drugs now used as muscle relaxants, hypnotics, and analgesics. . . . The ostensible indifference of physicians should no longer be used as a justification for keeping this medicine in the shadows.